Summary: Difference Between Information Processing Cycle and Machine Cycle is that Computers carry out processes using instructions, which are the steps that tell the computer how to perform a particular task. While Machine Cycle For every instruction, a processor repeats a set of four basic operations, which comprise a machine cycle: (1) fetching, (2) decoding, (3) executing, and, if necessary, (4) storing. Computers process data (input) into information (output). 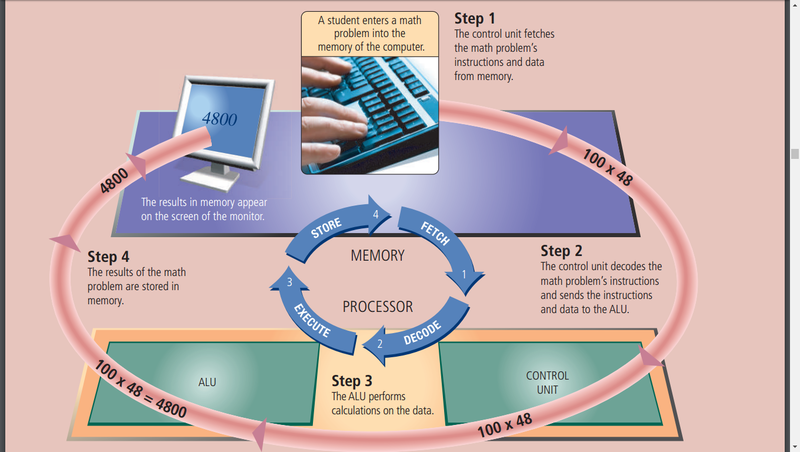 Computers carry out processes using instructions, which are the steps that tell the computer how to perform a particular task. A collection of related instructions organized for a common purpose is referred to as software. A computer often holds data, information, and instructions in storage for future use. Some people refer to the series of input, process, output, and storage activities as the information processing cycle. Recently, communications also has become an essential element of the information processing cycle. Machine Cycle For every instruction, a processor repeats a set of four basic operations, which comprise a machine cycle: (1) fetching, (2) decoding, (3) executing, and, if necessary, (4) storing. Fetching is the process of obtaining a program instruction or data item from memory. The term decoding refers to the process of translating the instruction into signals the computer can execute. Executing is the process of carrying out the commands. Storing, in this context, means writing the result to memory (not to a storage medium).